The SMARTS consortium will operate the 1.5, 1.3 (2MASS), 1.0 (Yale), and 0.9m telescopes. These images were taken in March 2002 and February 2003. Thumbnails Description. Click on highlighted text to see or download full 1600x1200 image. A1. CTIO viewed from the dorms. The view is up and towards the south. The silver dome is the 4m Blanco reflector. From right to left, the domes on the plateau enclose the 1.5m, Yale 1.0m, 24" Curtis Schmidt, and 16" (closed). The slim tower on the right of the plateau is a seeing monitor. The shadowed while structure on the horizon to the right encloses the GONG solar telescope. The 0.9 and 1.3 m telescopes are not visible in this view. A2. The 1.3m dome as seen from the west. A3. A closer view of the plateau from the north. The 1.5m, Yale 1.0m, and 16" domes are visible to the right of the Blanco 4m dome. A4. Another view of the plateau from the north. The 1.3m telescope is visible to the right. A5. The 1.3m dome as seen from the south, projected against the foothills of the Andes. The 1.3m will use the ANDICAM UBVRIJHK simultaneous optical/near-IR imager. A6. The 1.5m (foreground) and 0.9m domes at sunset, viewed from the 4m Blanco. A7. The Curtis Schmidt (center foreground) and Yale 1.0m domes at sunset, viewed from the 4m Blanco. The 16" dome is in the rear, the 0.9m is cut off to the far left. The slim tower is a seeing monitor. A8. The plateau from the northeast. From left to right are the Curtis Schmidt, 4m Blanco, 1.5m, and 0.9m domes. The YALO night observer is arriving for work. A9. The 1.5m open for business. 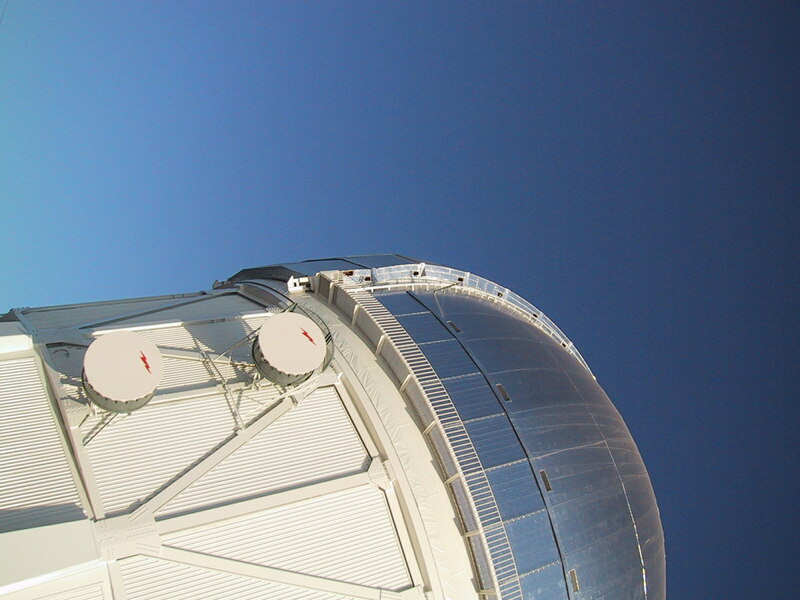 The windscreen blocks view of the telescope itself. A10. The 1.5m open for business. The windscreen is down; the secondary mirror mount can be seen at the bottom of the slit. A11. 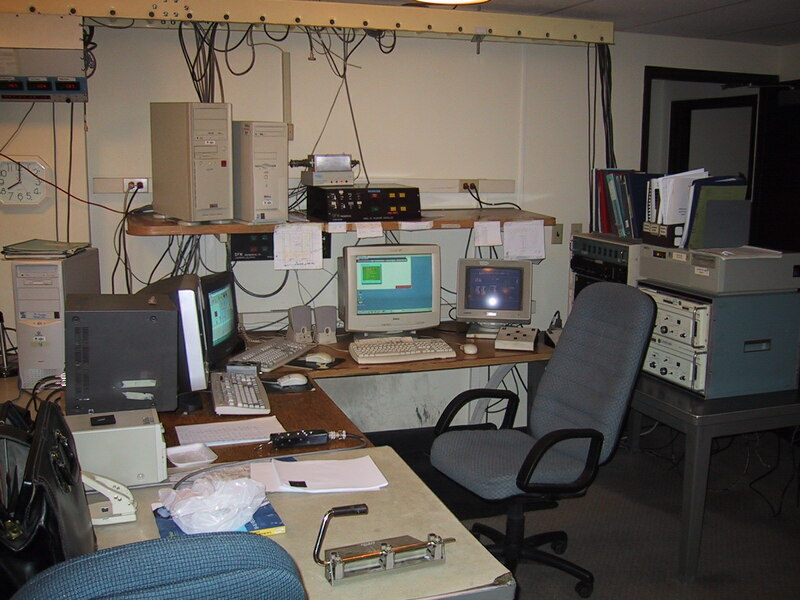 Another view of the 1.5m, taken in February 2003. A12. The 0.9m open for business. The secondary mirror mount can be seen through the slit. A13. The 1.5m and 0.9m telescopes, taken in February 2003. A14. The 0.9m telescope, taken in February 2003. A15. El Anano, the dwarf. A16. El Anano, in the shadow of the 1.0m. A17. The 1.0m, with Gemini-S and SOAR in the background. B1. Astronomer on site. From left to right are the 1.5m (cut off), 0.9m, 16", and Curtis Schmidt domes. B2. Astronomer on site. From left to right are the 0.9m, 16", Curtis Schmidt, and Yale 1.0m domes. B3. Astronomer on site. Serena Kim in front of the Yale 1.0m and Curtis Schmidt domes. B4. Astronomer at work. Serena Kim at the 4.0m console, running the HYDRA multi-object spectrograph. B5. 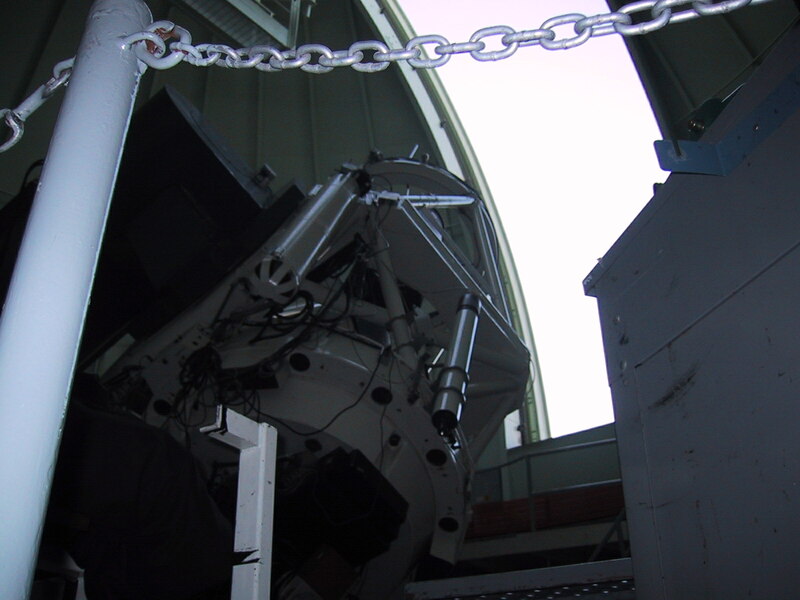 Telescope operator Mauricio Fernandez at the 4.0m telescope console. B7. 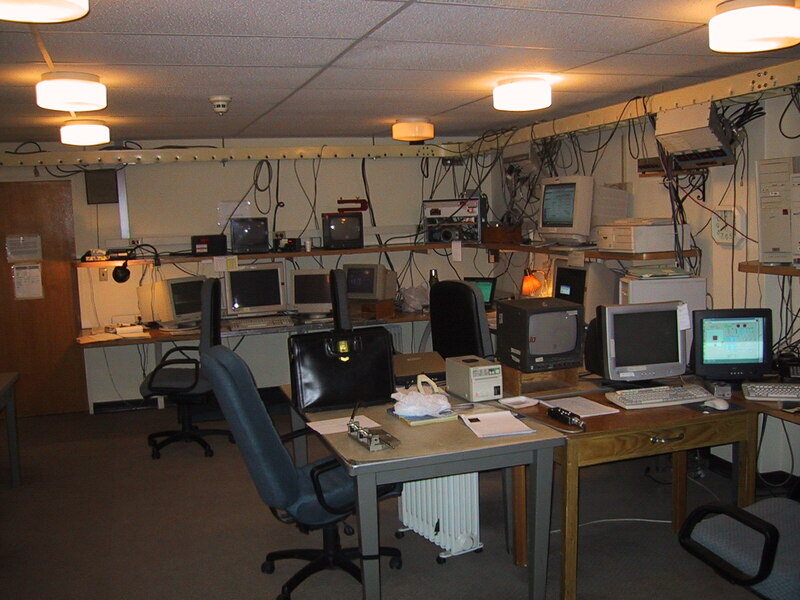 The 1.5m telescope operator's console (before consolidation). B10. 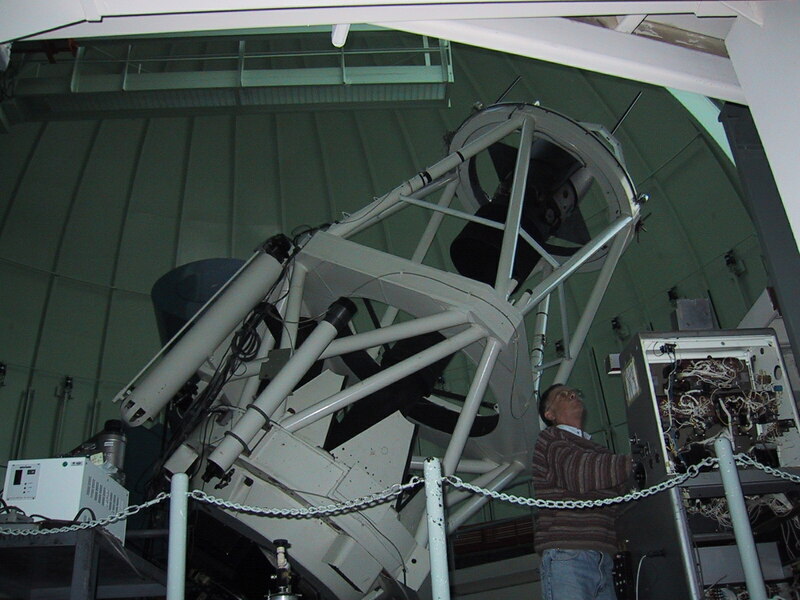 The 1.5m telescope, showing the R/C spectrograph mounted at the cassegrain focus. B11. The 1.5m telescope, looking down on the primary mirror. The black tube is a light baffle. B12. The 1.5m telescope, showing the primary mirror, the mirror covers, and the light baffle. B13. 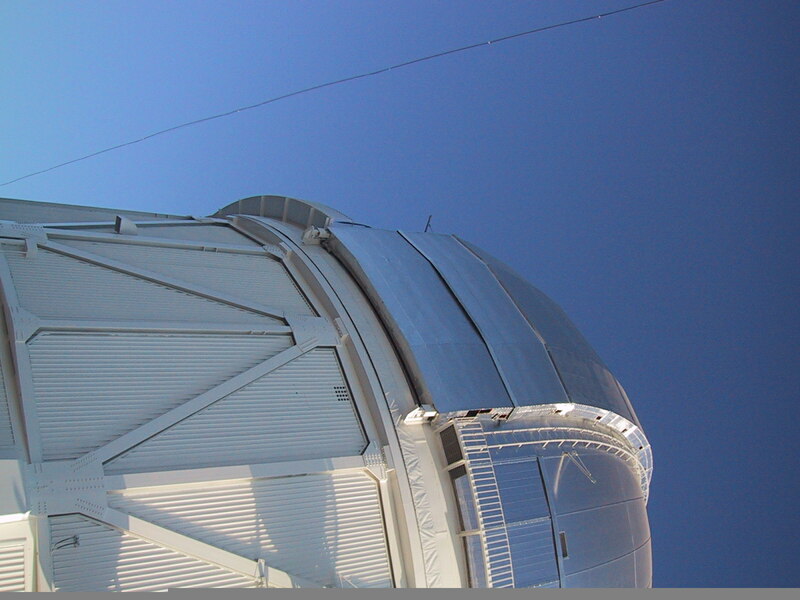 The R/C spectrograph, mounted on the 1.5m telescope. B14. The 1.5m telescope, looking up. C1. Foothills of the Andes, looking south from Cerro Tololo. C3. The domitories, looking northeast just before sunset. C4. Cerro Pachon as seen from Cerro Tololo. The SOAR (under construction) and GEMINI-S domes are visible. C5. The shadow of Cerro Tololo. stretching over the Round Office Building and the staff dormitories. The Lowell 24" dome is to the right. C6. Sunset at Cerro Tololo. D1. The shutter of the 4m Mayall, after the cables snapped. D2. Another view of the 4m Mayall shutter, after the cables snapped. D3. Gullies along the road to the summit, following a torrential rainstorm. Looking east (downhill). D4. Gullies along the road to the summit, following a torrential rainstorm. Looking west (uphill). D5. Thinking about how to fix the shutter.